Ok guys, this really won't be a restoration by any means, but a cleanup and customization of the existing platform. I'll be straight forward and say that the previous owner was a hack at best. As nice of a guy as he was, he had no business working on a jeep. 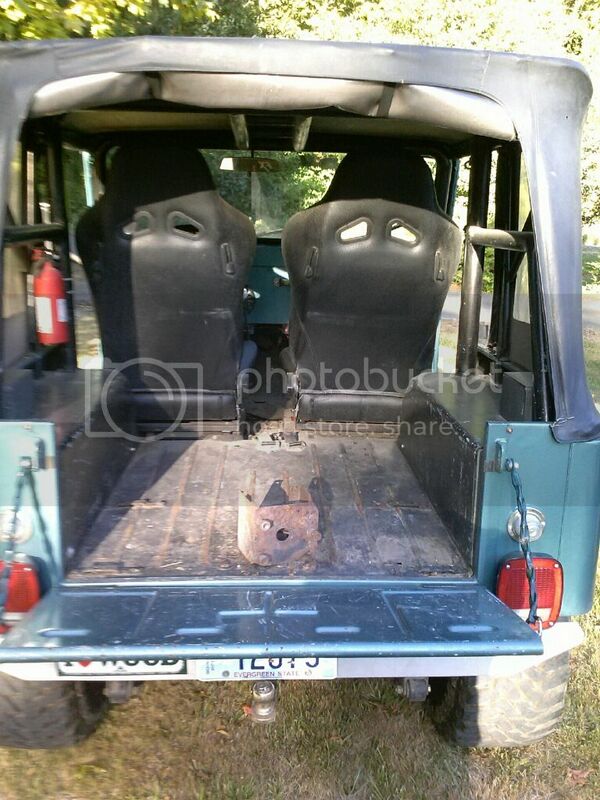 A, The jeep when completed must fit inside my toy hauler. That means a max overall height of 78" and a max overall width of 67" wide. 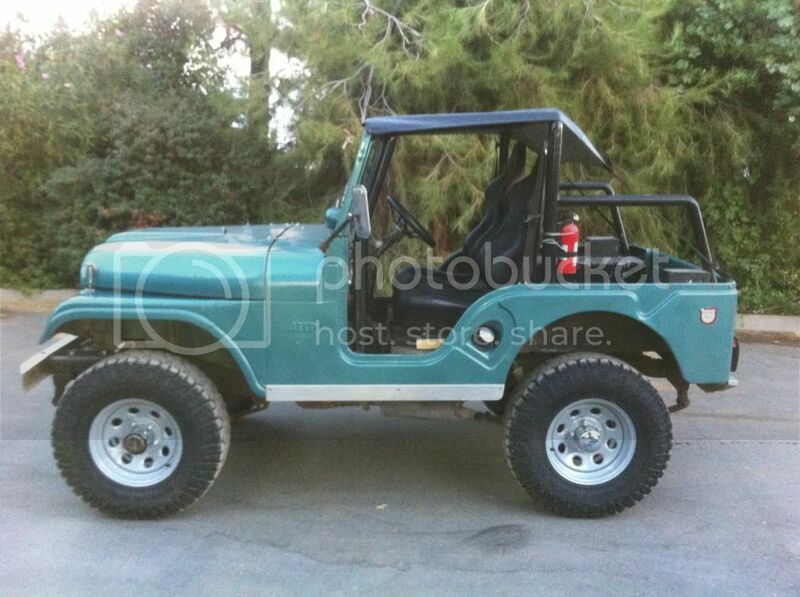 Currently with the 33" tires and 2.5" rancho lift it is 76.5" tall. B, The total weight fully equipped must not exceed 3,000 lbs. When i brought the jeep home last week, I drove it to the truck scale full of fuel and it weighed 2,820 lbs. 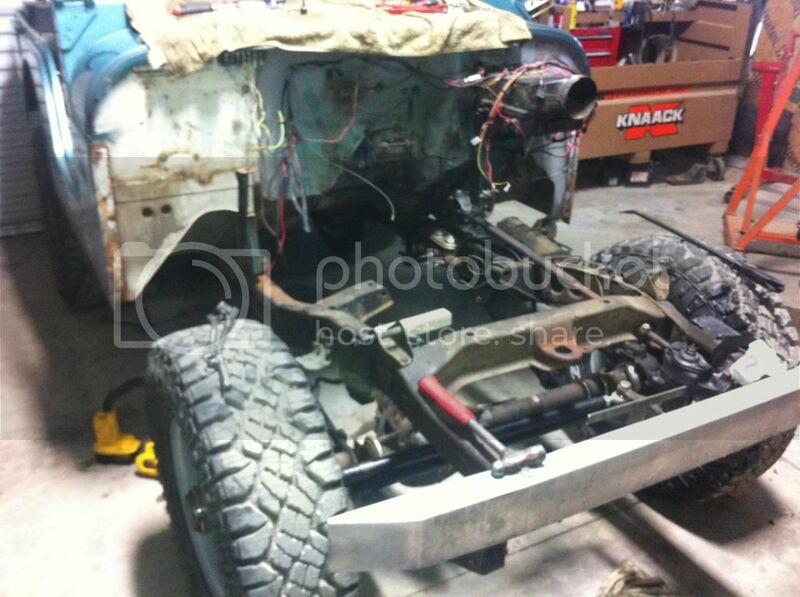 There's plenty of weight to be trimmed off of this jeep as I will explain as the build goes on. C, The jeep must retain its street ability. I'm really not sure who is more excited about the jeep, me or the female of choice, but I can tell you now that she will end up driving it at least once a week. I bought it and it was my idea, but she has already said the dreaded words "My jeep". I'm really not too worried about her being able to handle the jeep; she is the only one in her entire extended family that doesn't own a jeep, and she has logged plenty of miles in far worse of jeeps than this one. I purchased the jeep from its second owner. He was family friends with the original owner and had been in it since it rolled off the lot. 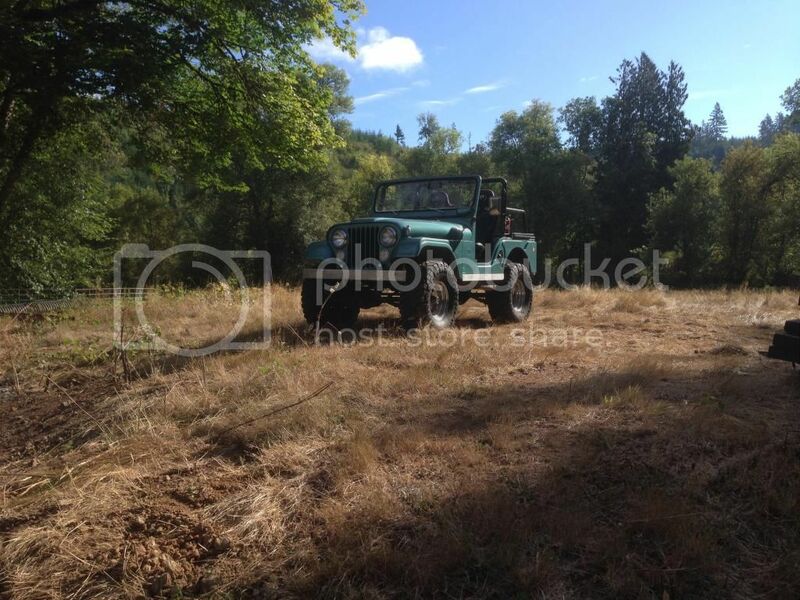 About 10 years ago, he had done what he considered a restoration on the jeep and hadn't really driven it since. Here are the current specs. Engine: Rebuilt 225 V6. Less than 2,000mi when parked. Offenhauser intake and Edelbrock 4bbl carb. 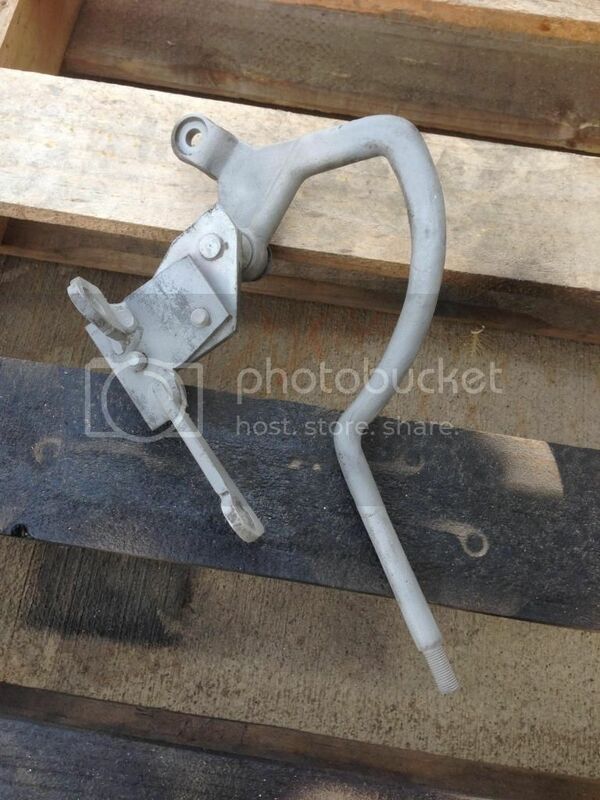 I think that the PO removed the secondary linkage. Rodents made a nest on the intake manifold. and destroyed the under hood wiring. The PO patched it together to sell it. Transmission: Saginaw 4 speed. 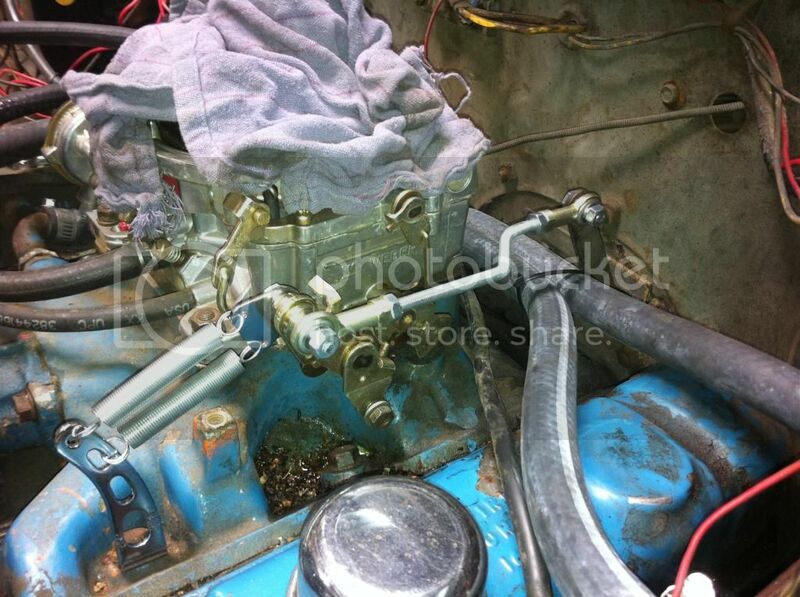 When the engine was out, the PO purchased an Advance adapters kit and installed the 4 speed with hurst shifter. Differentials: Front is a rebuilt D27 and rear is a D44 with some sort of a locking diff. I'll have to pull the cover and inspect. Gear ratio is un known. It's too high for the 33" tires. 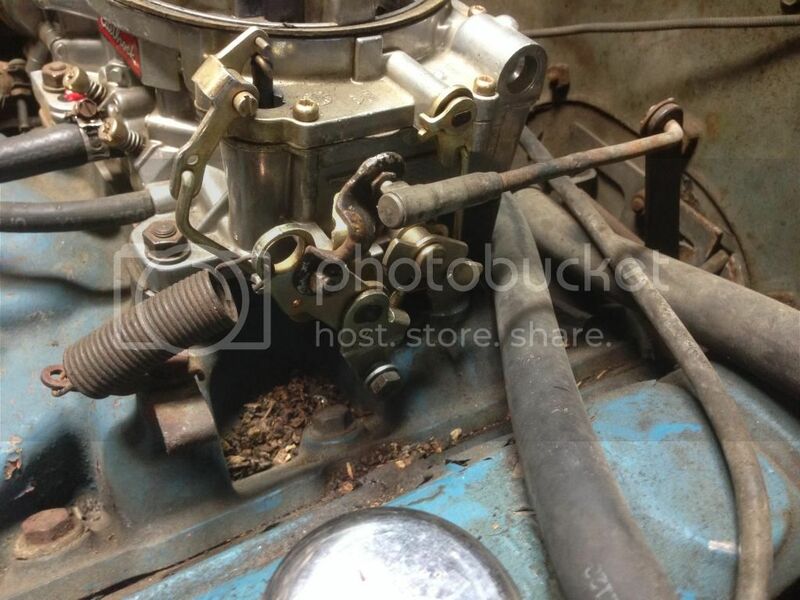 Steering: Saginaw manual box with some hacked in tie rods and heim joints. 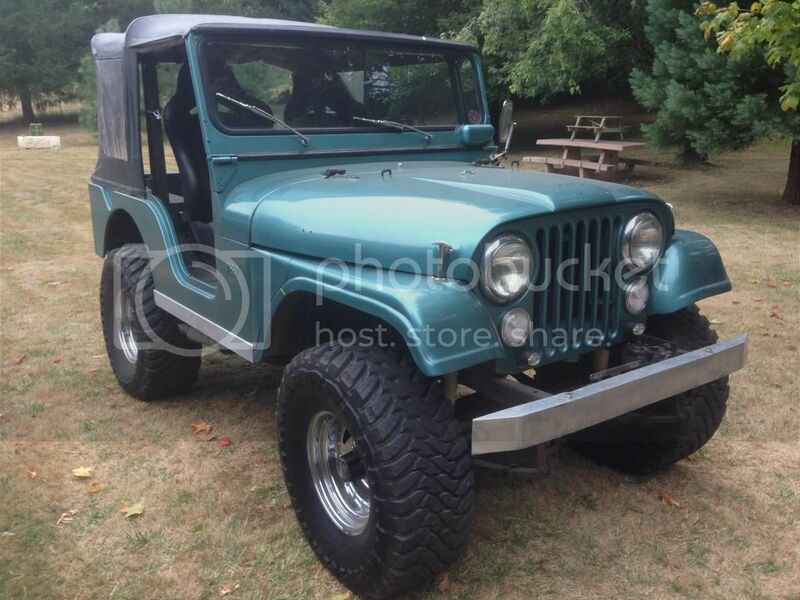 I have on order from herm: reinforced knuckles, HD tie rods, correct manual pitman arm. Suspension: New Rancho 2.5" lift suspension kit with adjustable rancho shocks. Tires: 33x13.50x15 Toyo Mt's. on 10" rims. STUPID. 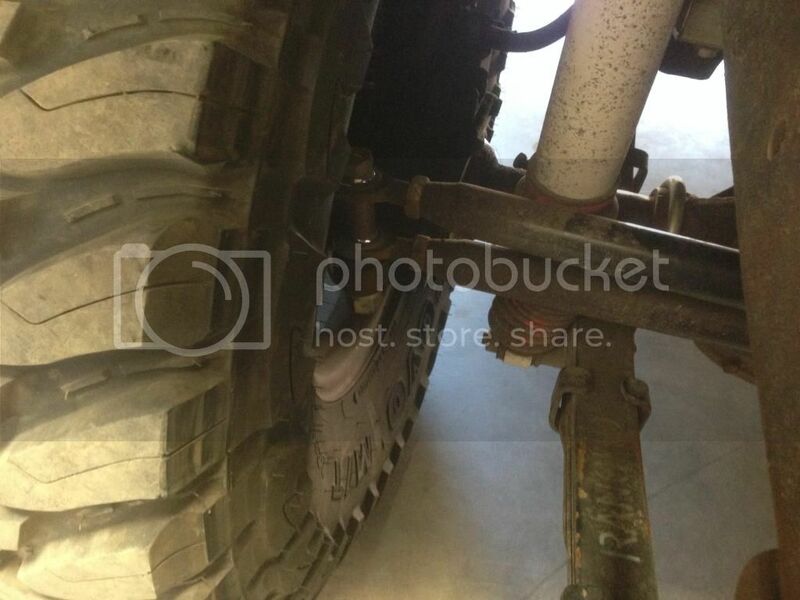 The tires cut the turning radius in half and rub everywhere when you look at them wrong. I'll be installing 31x10.5x15's on 7" rims very soon as the jeep is barley drive able now. Looks like a great start! 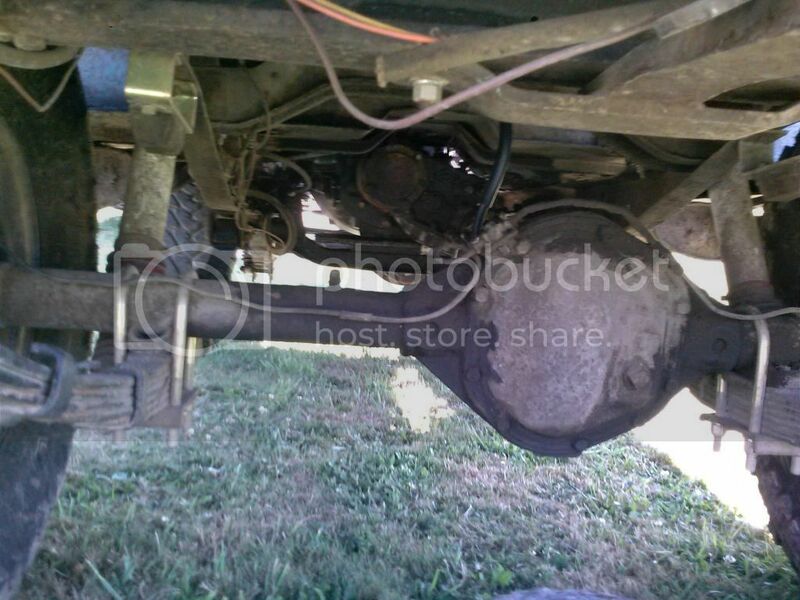 Have fun with it, might look into the dana 30 axle for more turning radius. Welcome from CO.. As Piffy said it looks like you have a good place to start from. Do something with the wires on the passenger side of the motor, even if's just a zip tie to keep the wires off of the exhaust for now. Yeah man, you got a real nice start there.. Just curious about the heim joints in your steering, I went the same route, how are they treating you. Also as far as getting it into a toy hauler, isn't the ramp going to be a concern weight wise? Also you can look into a offset rims to cure the rub, I found some nice steelies with a 2.5" offset that got me where I needed to be.. I pulled up all the wiring laying on the exhaust and zip tied it up. I have a wiring harness on its way, but i don't want to install it until winter time if i can get away with what i have for now. Jeepenstein, I have parts on order from Herm to remove the heims. I don't like the two stacked on the right side, and the PO used the cheap kind which are already worn out. Quality heims like we run in our race cars will run me over $100. Herm is setting me up with reinforced knuckles, his HD steering kit and the correct pitman arm. I am pretty sure that most of my rubbing issues stem from the 10" wide rims and 13.5" wide tires. 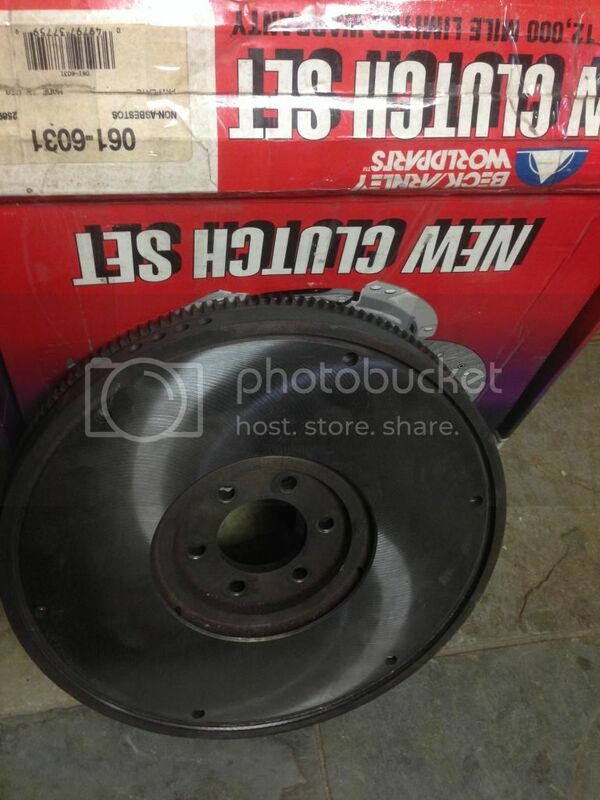 I have a set of 15x7" cragar soft 8's and 31x10.5 goodyear duratracs that should be going on this weekend. If the new tires and wheels still rub, I think ill try out some 1.25" wheel spacers. The Toy hauler is rated for 3,000 lbs of cargo capacity, and the back door should be plenty stout enough to get it up. The 3,000lb capacity is why the jeep has to stay so light. Do you guys have any idea if the color is a factory one? I can seen in the back of the tub that the interior was white at some point. I happened upon a couple cans of hampsted green, the color on the cap looks very close to the body color. I don't think that its spruce tip green. In the next couple days ill get after it with the 4k hot pressure washer and see what I uncover. under the hood. 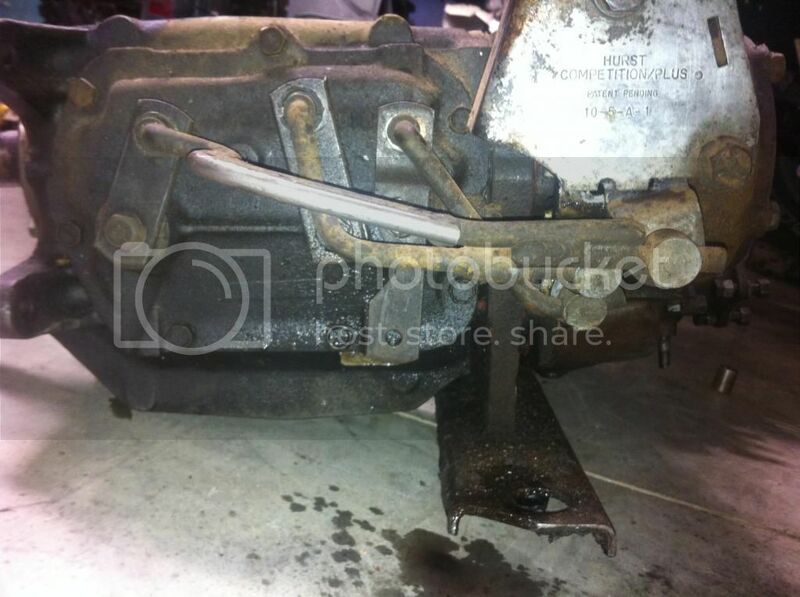 Looks like a closed knuckle front axle (D27). 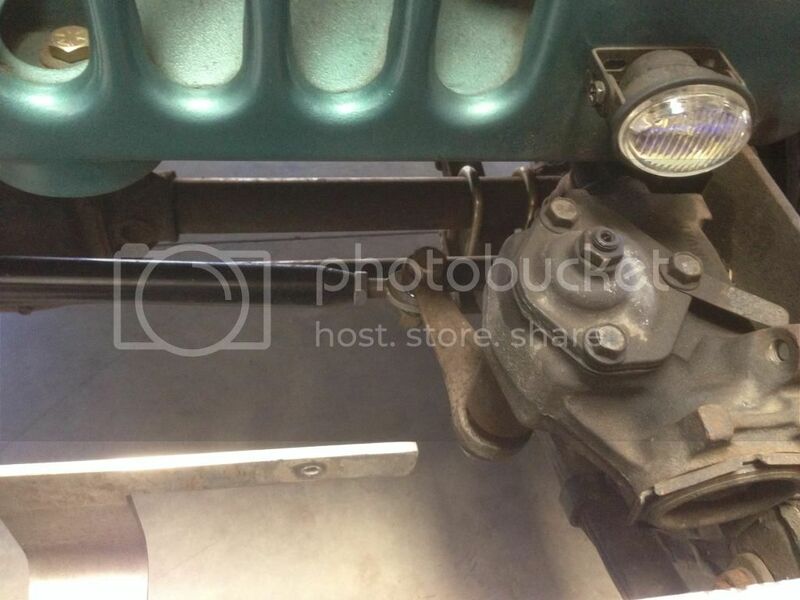 The pass side knuckle with the 2 tie rods attached is dodgy. Looks like the PO just stuck a bolt all the way thru the hole and put in a spacer between the two heim joints. Did you get a 2-hole passenger side knuckle from Herm? New tires and wheels. 31x10.5 Goodyear duratracs and cragar soft 8's in silver. Cut 140lbs off the jeep with the change and now were down to 2,680 lbs! Also in decreasing the tire size I lowered my gear ratio and slowed my crawl speed down. Well I broke out the hot pressure washer and gave the jeep a good steam cleaning. Hot works so much better than cold! 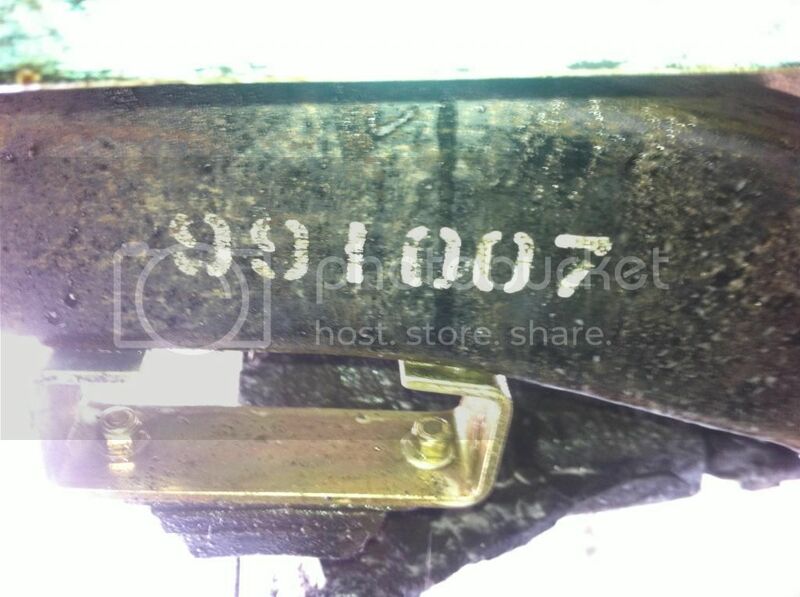 When I was all done, I noticed i uncovered this painted on the rear frame portion. Its stenciled on each side. Anybody know what this means? It doesnt match any of the vin numbers. 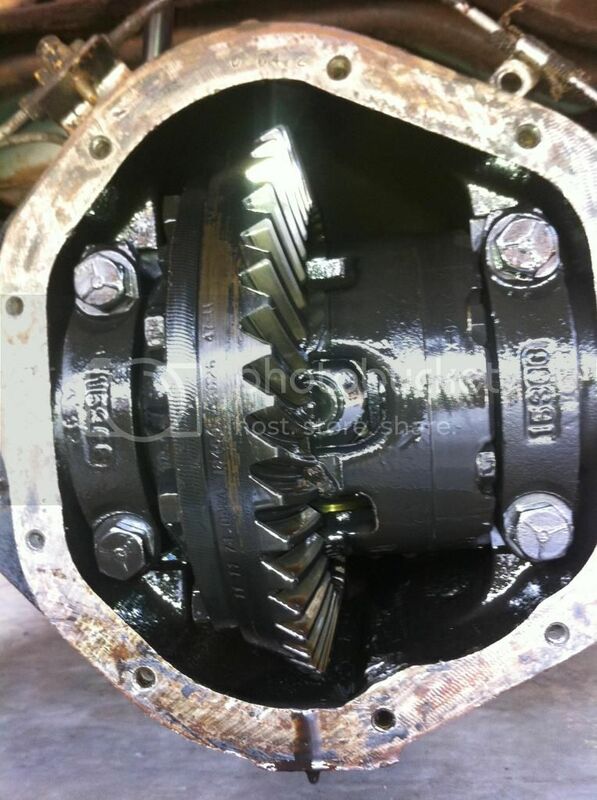 Pulled the diff covers to see what gear ratio I have and change oil. Po had the gears changed to 4.27, which I feel is a nice compromise between 3.73 and 4.88. Also, I found the the rear has a powerloc. I'm considering picking up a powerloc for the 27 up front from Herm. I resealed the Diffs and used limited slip oil with a friction modifier in the rear. I drove the jeep to church on Sunday, it was my first real drive in the jeep, 20 mi each way of freeway driving, and I need an overdrive! I could probably go 65 if I was flat out, but I don't want to work the motor that hard. Moderators, please change the name of my build to the LACK OF COMMON SENSE build. 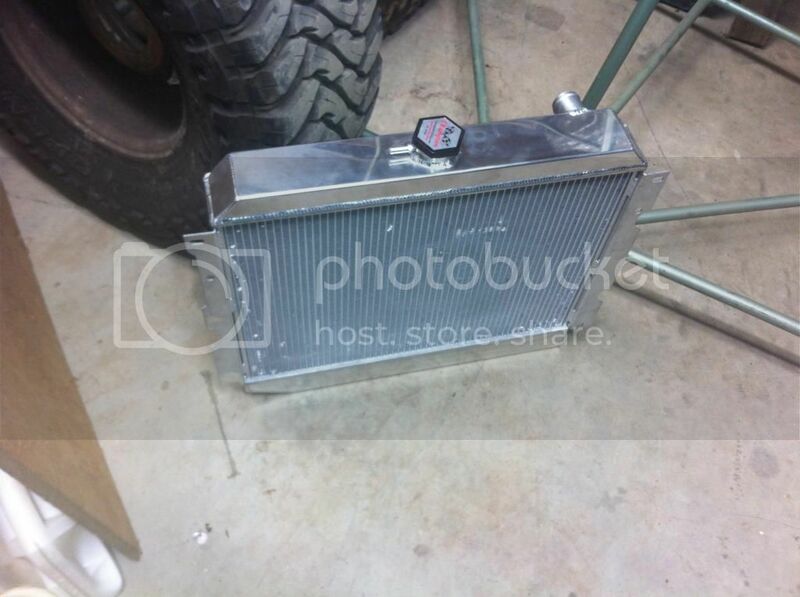 I picked up a 3 core aluminum radiator for a 70 Plymouth challenger, 180 thermostat and new hoses. The radiator fit the grill perfectly however it was a little thicker than I had originally measured. I figured that it wasn't a big deal since I had a 2" fan spacer on the water pump and went about my cooling system rebuild. Right out of the box, both water neck bolts broke off in my offy intake, strike 1. I decided that I was tired of leaning over the fenders and grill so I removed the grill. To my suprise, with the grill removed, the P.o's saginaw install involved a cutting torch and removal of half of the front x member. The more that I looked at the front frame the more I felt that something wasnt right, the front clip is bent to the left about 2"! The entire front axle is shifted left of the rear about 2", which makes sines now why it would turn good one way and lousy the other. Looking down the frame rails with the front end off really shows it. 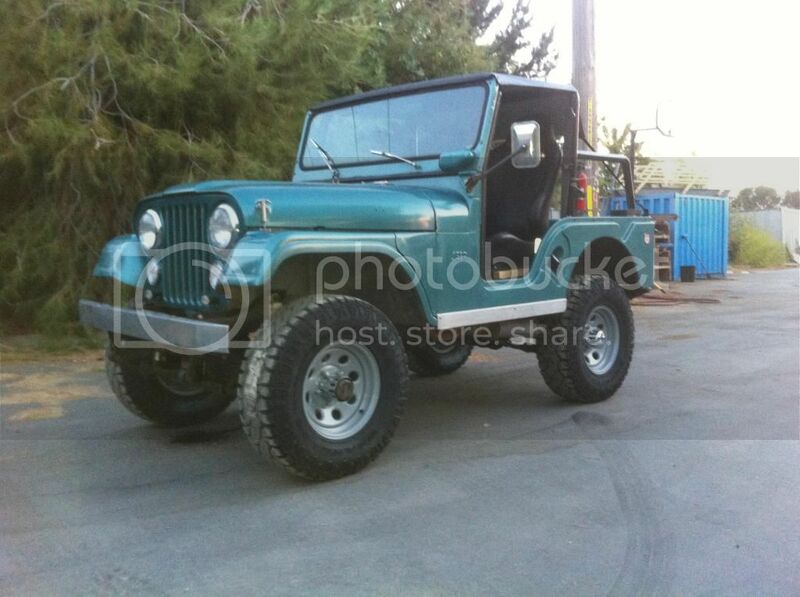 So this afternoon I am dropping the jeep off at the frame shop. Since the drive train is now removed and I will be building a front x member, I have decided to pull the body off and repaint the frame, underside of the body, and fix a couple floor pan rust issues. My simple cooling system upgrade has basically become a frame off resto! 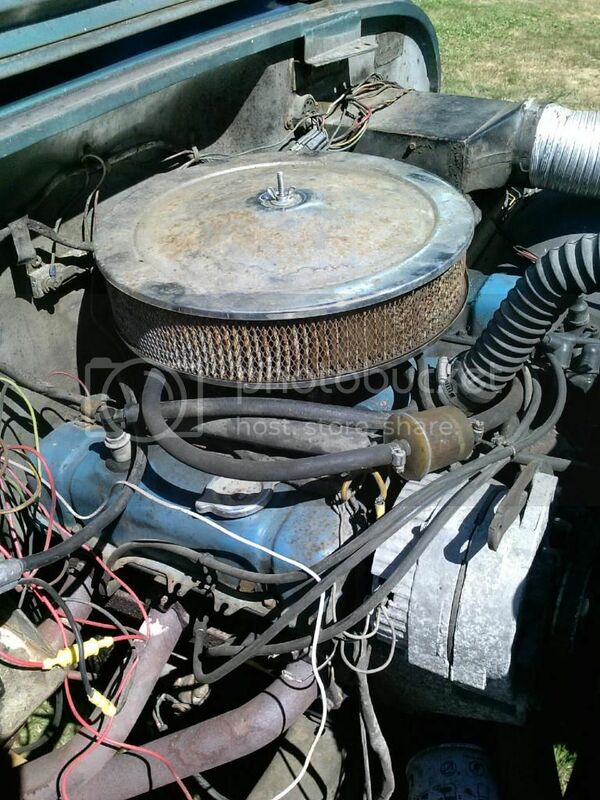 The last pic is of my non vented saginaw 4 speed. I was thinking of adding a vent in one of the un used bosses above the shift cover. 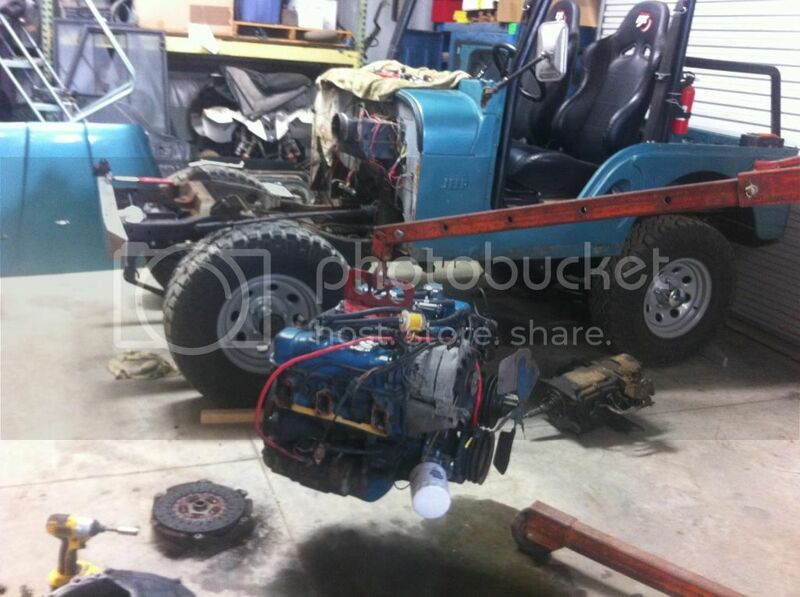 The jeep will be at the frame shop for another week so I worked on getting the engine cleaned up. 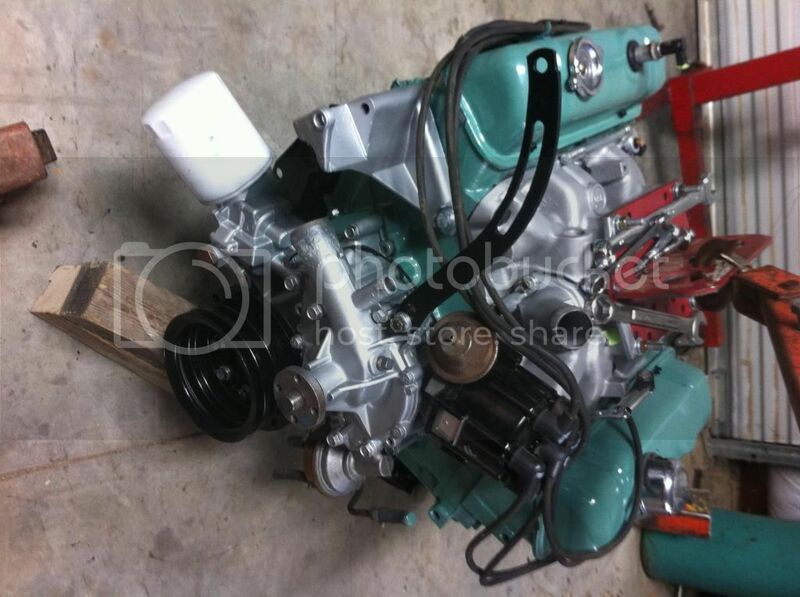 The engine had about 10,000 mi on the rebuild but the paint job was horrible so I gave it a duplicolor rebuild. I had to remove my intake to get the broken thermostat bolts out and while it was out, I glass beaded the orange and blue paint off of it and hit it with a little clear coat to keep it from staining. I also removed all of the tin and alum pieces from the engine, glass beaded and repainted them as well. Now all I need to complete the engine is a new roller pilot bushing and the water pump bypass tube. I stopped by the frame shop yesterday and they had the jeep on the rack. There is no real way to get the frame perfect without completely stripping it, cutting/heating/bending and reinforcing it so I'm going to run this one for now while I look for a donor which I'll have blasted, then box the frame and install on a rainy weekend. Right now were shooting to just get the front suspension square with the rear suspension. I'm still going to paint the frame and axles, but I'm not going to pull the tub and do a frame off on a frame that wont be there long term. Ive been cleaning up small parts and painting them while waiting for the frame shop. 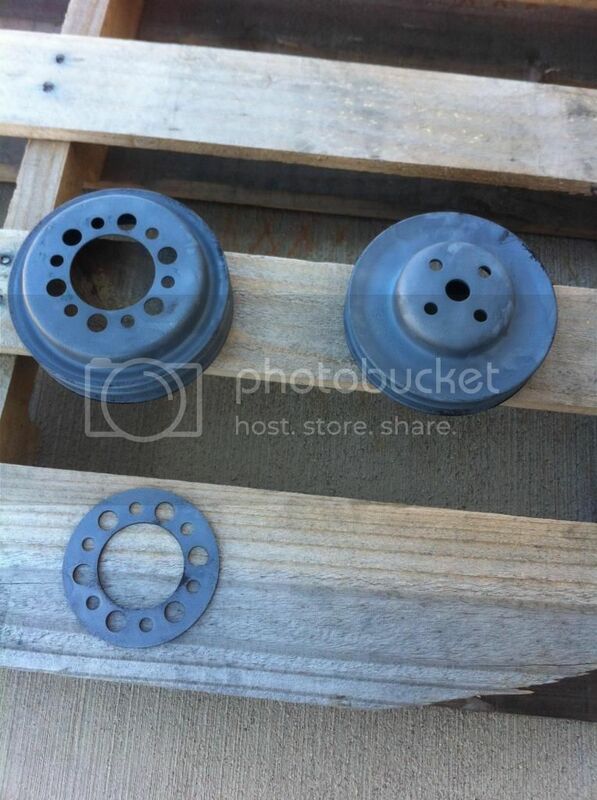 I got my flywheel resurfaced and new clutch ready to install. Nice Jeep. How is it to drive with the car 4spd? 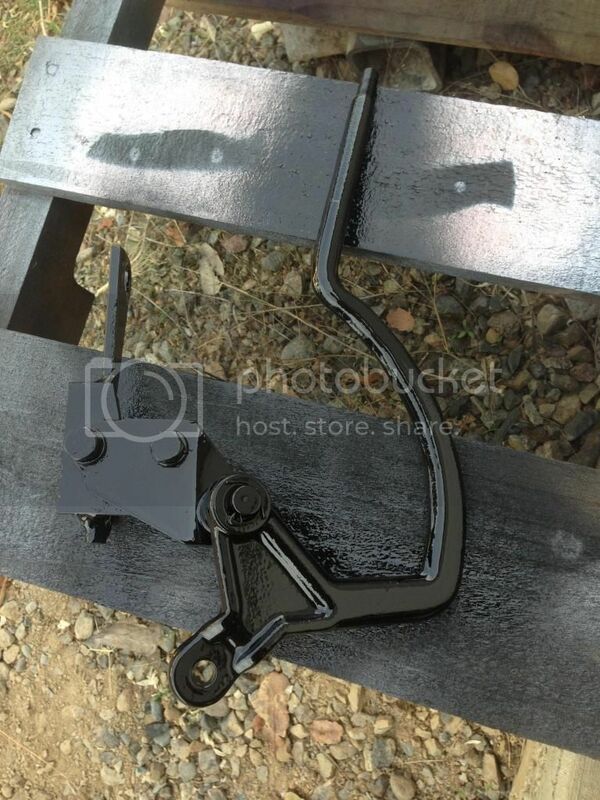 It's the Jeep factory part number for a replacement frame. Wonder if your frame has been replaced before? Or....the factory brought this number into production. It might have something to do with the changing of the diameter of the steering bellcrank shaft bracket mounted on the frame. This number would not usually be on a factory original frame. The Saginaw 4 speed makes it feel like your driving a 60's era muscle car, until you hit a bump and remember that your in a jeep! I'm not sure on the frame numbers. I know that this frame is bent! Ive got a line on a frame that is supposedly straight, if so ill box it in and swap it when I have some help.